Cooperative Working Together (CWT) is working hard to try to improve the low milk pay situation by altering the supply and demand factors. In this post, we'll examine their programs to see what might be expected. Because this post is largely critical of the CWT efforts, a copy of this blog is being forwarded to their office in case they would like to add comments expressing their differing opinions. In many of the earlier posts (April 7 & 23 posts), we discussed the relationship between cheese prices and milk prices. The relationship is very tight. We've also demonstrated that the cheese price is primarily linked to imports which are heavily influenced by exchange rates (April 13 post). The current policy of CWT is to influence the U.S. milk supply through herd retirements. They are, for now, abandoning their efforts to influence exports. Quoting from the CWT website, "the export program will not be utilized in 2009". By the way, New Zealand's leading dairy publication is "Dairy Exporter". Can they really have a lasting influence on milk supply through herd retirements? When there are profits in the U.S. dairy industry, cow numbers will increase. When there are no profits, cow numbers will decline. Any external attempt to artificially alter this relationship will have a very short term influence. While there are serious issues on milk pricing in the U.S., the current CWT effort - which was developed by some very knowledgeable people sure seems to not address the real issues. Producers need every cent to survive the current situation. It is not a time to waste any desperately needed funds. Let's see if there is a rebuttal. I encourage CWT to post a comment refuting these facts. That means that when Cheese prices move, there is a 9.6x impact on the Class III price. However, when butter prices move there is only a .4x impact. While the dry whey price has a 5.9x impact, the value of whey is small enough that the impact is minimal. The whey supply is obviously tied to cheese production, but the demand side can be very different. I've had a few comments on this questioning whether cheese prices can really have this big an impact on a dairy producer's economic health, so I've developed a few charts to substantiate this relationship. The first chart shows the correlation between cheese prices and the Class III milk price. 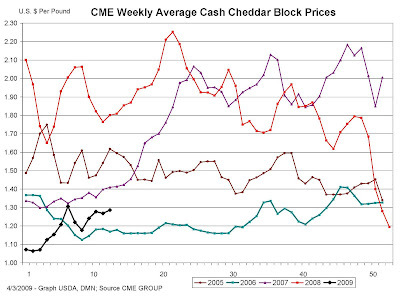 I have used the National Agricultural Statistical Service (NASS) market survey price for cheese, not the Chicago Mercantile Exchange (CME) cheese pricing (see April 2 post). The correlation is almost 100%. This is in spite of changes in the "make allowance" for cheese over this period of time. The 98% correlation means that 98% of the change in Class III milk prices can be predicted by changes in the cheese price - a very strong correlation? The chart below goes one step further and tests the correlation between all Federal Milk Marketing Order (FMMO) milk prices and the NASS cheese price. This FMMO pricing includes those orders paying on skim and butterfat and well as the component pricing orders which dominate the FMMOs. Again, the correlation is very strong. This is partly because the component payment milk orders are such a large part of the overall FMMO's milk volume. Numbers don't lie. Cheese prices really control the financial health of the U.S. dairy industry. In the April 9 post, the U.S. domestic consumption of cheese was analyzed. It did not show any significant changes from historical trends. Domestic cheese consumption is steady and predictable and does not contribute to price volatility. Through much of 2008, the U.S. dollar (USD) was weak and exports were at the highest levels in years. 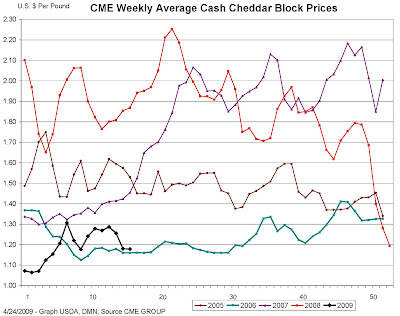 However, as the USD strengthened in late 2008, U.S. cheese became more expensive on the global market. As the price went up, the exports went down. As the exports went down, cold storage inventories went up and prices went down (see the graphs linked in the right hand panel). There is a similar but reverse impact on cheese imports. When the USD was weak in early 2008, cheese imports were at the lowest levels in five years. Domestic cheese was less expensive. However, when the USD strengthened in the 4th quarter of 2008, imports surged. Expressing it differently, if exports and imports are netted, the volatility over the last 5 years really shows. Below is the weighted average value of the USD vs. 6 other major currencies. 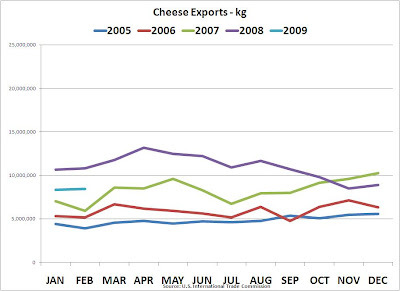 It's easy to see how the swings in the value of the USD parallel the exports and imports of cheese. The price of Class III milk is really determined by the cheese price (April 7 post). The demand for U.S. cheese, which significantly influences the price, primarily varies with exchange rate fluctuations. What's the short term outlook? The USD is strengthening, cheese prices are remaining low, and inventories are still high - not a pretty short term picture. In an upcoming post the countries we export and import cheese to and from will be analyzed. Later, the long term factors influencing cheese and protein prices will be covered. What Influences Class III Milk Prices? Only One Commodity! 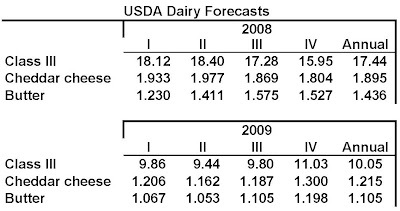 The formulas for 2009 milk pricing are listed on the USDA site. Click on the link and it looks complex. Let's simplify it. Two thirds of the dairy cows in the U.S. (~ 6M cows) are paid on the component system, so let's concentrate there. There are only three underlying variables in all those equations - cheese, butter, and dry whey prices. How do variations in the price of these three processed commodities impact the milk check? Below are three graphs that show how variations in these commodities cause the Class III milk price to vary. In each graph below, two of the variables are kept constant and only one is varied. The butter, dry whey, and cheese prices are varied over their normal ranges. The butter price has almost no impact. 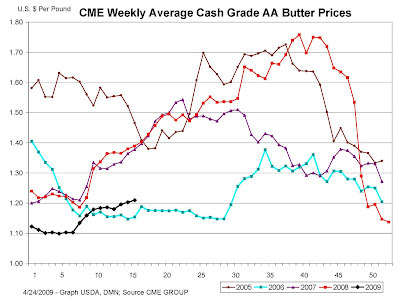 When the price of butter goes up, the value of butterfat goes up, but the value of protein goes down! They are almost equally offsetting. The impact on Class III milk price is insignificant. When dry whey prices increase, the milk check increases. But whey has such a small value that the impact on the milk check is minimal. However, when the price of cheese goes up, the milk check gets really interesting! The standard Class III formula assumes 3.1% protein, 3.5% fat and 5.9% other solids. Combine the above with the cheese price impact on somatic cell count adjustment value (see the March 31 post to this blog) and it becomes clear that for two thirds of the cows in the U.S. , a producer's income is tightly linked to the price of cheese. The impact is big enough that when cheese prices are high, a lot of operational shortcomings can be "covered". However, when cheese prices are low, it's tough for even the best operations to cash flow positive. 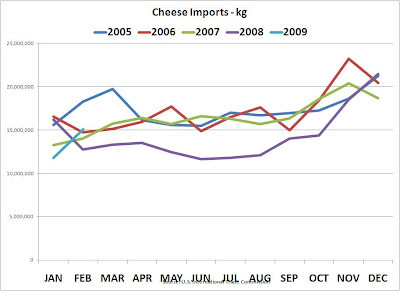 What influences cheese prices? Find out in an upcoming post to this blog. April 3 is the date for release of the March milk component prices. Changes from February were upward with a 15% increase for protein and a 6% increase for butterfat. Protein as usual is dominant in the Class III milk pricing. The pie chart below is calculated at 3.1% protein, 3.5% butterfat, and 5.9% other solids (the Class III standard calculation) and an average producer price differential of $1.42. Obviously, protein is still the dominant element in the milk check. Weekly cheese and butter prices were also updated today. Check them out through the links on the right. Prices remain stable and above year beginning lows.